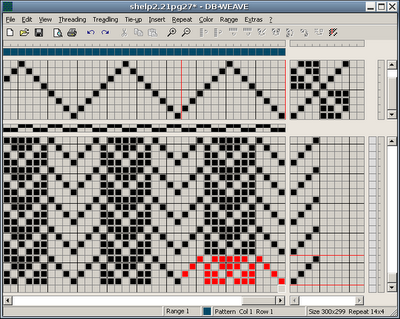 I've already blogged about ArahWeave and WeaveDesign. The other day, Laritza passed this one on to me; another weaving program that runs on WINE. 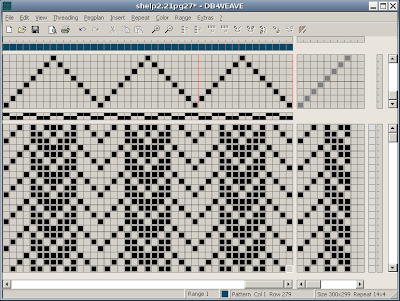 It 's freeware, it's from Brunold Software, and it's called DB-WEAVE. I was doubtful at first, because the initial blurb states that it is for designing dobby loom patterns, but as I read on, I was delighted to discover that it also has a tie-up mode. I got it up and running in WINE in no time. Like a lot of freeware, the help files are pretty much nonexistent. To explore the program, I inputted a draft from Shelp & Wostenberg's Eight Shafts: A Place to Begin. You can click on almost any photo to enlarge. I have figured out that the red lines indicate the basic threading and treadling units. The drawdown highlights the intersection of these in red at the bottom right hand corner. I found "Options" under the "Extras" menu. These can be set as your default settings, or for individual drafts. You can see that "Sizes" sets the number of shafts, treadles, epi, and ppi. "Grid" overlays a grid on the draft, making it easy to keep your place. 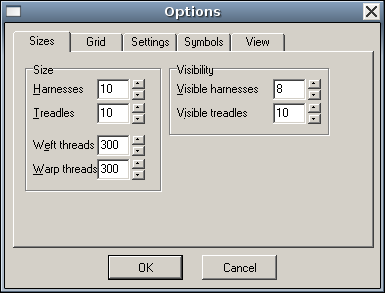 "Settings" allows you to choose single or multiple treadle modes (which I need for skeleton tie-ups and treadling! ), and rising or sinking shafts. 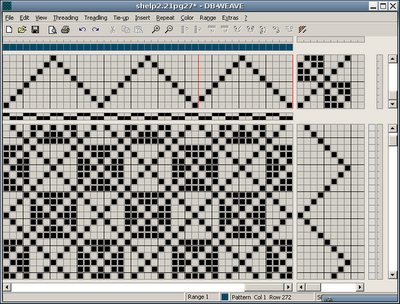 "Symbols" is for how the grid squares are filled in, and "View" lets you choose how draft is viewed on the screen. Threading options include mirroring, normal or straight rising and falling, 2 choirs (above), 3 choirs, fixed, user defined, and copied from treadling. The Treadling menu includes mirror, normal rising and falling, crossed, fixed, and copy from threading (above, aka "tromp as writ" or "as drawn in." Tie-up menu allows invert, roll (up, down, left, or right), and slope (increase [above] or decrease), or make central symmetric. ..... color view, with the weaver's choice of warp and weft colors. .... pegplan mode. There's also a "weave" option in that menu which apparently tells the computer to talk to the loom. However, I don't have a dobby loom, nor are my computer and my Glimakra on speaking terms, so someone else will have to tell us all about that. "Extras" also lets the weaver change the warp/weft ratio, and base setting for the program (choice of American, Scandanavian, or German/Swiss). Language options are English or German. 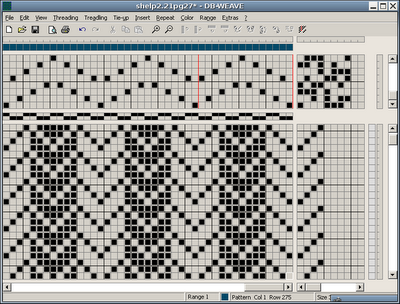 I haven't figured it all out yet, but I do find this program easy to experiment and play around with. I'm sure some of the menu options are dobby features. 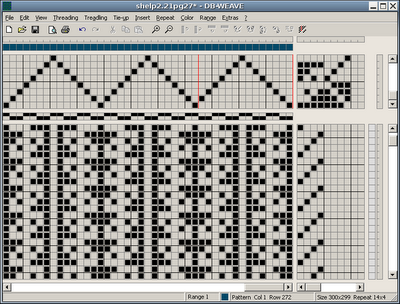 To me, it's the easiest free weaving software I've worked with so far. So for the moment, it's the one I'm going to stick with. This seems like quite a good program. Thanks for the writing about it! Oh Leigh, thank you so much for posting this! I have installed it, it is quite impressive!! This is fabulous! I believe I will be installing it for a friend who is lucky enough to own a large loom. I think I will acquire the program in the near future as well. end feed shuttles and boat shuttles, I've published a long post on my blog. 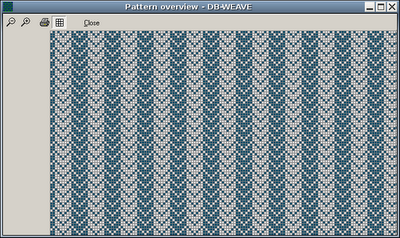 DB weave looks good. However, I'm looking forward to seeing the final translated version of the Dutch software Winweef. It's got some nice features, and runs with under Linux if you use WINE. (I helped proof read the translation). I downloaded it today but can't get it to display the cloth area. I have changed all the settings and unless I select treading by treading I can not see the cloth. I wonder why? Thanks for visiting my site. I value your blog very much. Your photos of your countermarch loom was so helpful when we turn my loom into a countermarch. Don't know why there's no link to it on their site. The manual is dated to 2005 and so is the program. Frida, you're an angel! Thank you for that link! Dorothy, I got a copy of Winweef from Rachel Hardy, but never got it up and running. That was before my computer crash and I lost in then. I'd be interested in a review on it from you! I download this program and love it. Thanks so much for sharing. Thank-you for sharing this information Leigh. 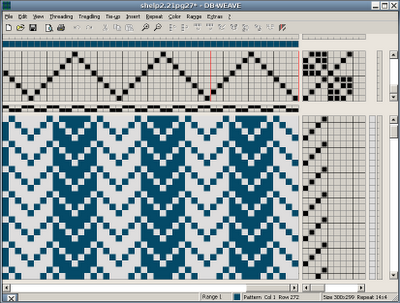 Do you think that I can use DB-weave for patterning narrow woven fabrics where the hook & loop formation take place? I have been searching for a program for those and have not really found anything good yet... Any suggestion will be appreicated..